My Custom-Made OrthoticsMost of us with RA have pain in our feet and ankles. According to an article I read on Medscape, up to 85 percent of people with RA will experience painful feet or ankles at sometime during their life with this disease. During the first year of diagnosis, 57 percent of patients report foot and/or ankle pain. Statistics are important, but statistics are numbers. What really matters to us is that our feet hurt. When our feet hurt, we have trouble getting around, and that is a bad thing for anyone. Not being able to walk keeps us from going places we want to go. It limits even more the amount of exercise we are able to do on a daily basis, and it isolates us socially. A few weeks ago, I was experiencing a lot of pain in my feet and ankles. I noticed that I was "shuffling" instead of walking, and I was walking on the inside edges of my feet. My ankles were turning in, as evidenced by the shoes sitting in my closet. They all looked as though a I was wearing them with tennis balls stuffed on the insides of both ankles. My shoe looked so "unnatural" that I decided it was time to take action. I was seeing my orthopedic doctor for knee injections, and so I took that opportunity to tell him about my ankles turning in and the pain I was experiencing in my feet. He immediately wrote a script for orthotics and sent me off to the Physical Therapy Center where the head of the department molded semi-rigid plastic orthotics for me to wear in my shoes. I must say I was pleasantly surprised at the ease of obtaining the orthotics. I always thought one had to see a podiatrist and go through a long, expensive process to have orthotics made. I was wrong. The PT guy took some sort of material wrapped in soft, insulating fabric, and molded it to my feet. I was laying on my stomach at the time, and the heat felt wonderful. I could have stayed there for hours! The entire process only took about 45 minutes. The PT guy cautioned me to only wear the orthotics 30 minutes at a time at first. It does take a while to get used to them. I did as he suggested, and I am happy that I did. It took me about ten days to fully adjust to the orthotics. I am now able to walk longer distances, and my feet and ankle pain is much improved. I also notice that my ankles are not turning in anymore. Somehow, these orthotics are helping correct my gait. I was born with mild hip dysplasia. Getting older and having RA have caused this "little" problem to become a major pain. I have torn cartilage in my left hip. That affects my gait, as does the torn meniscus in my left knee. The pain I was experiencing has been greatly reduced as a result of my RA medications, but the gait problem is still there. The orthotics have helped correct my gait, and I am very pleased with the resulting decrease in pain and uneven gait. If you do decide to try orthotics, you need to put them in a good shoe. I wear SAS shoes and Asics or New Balance tennis shoes. 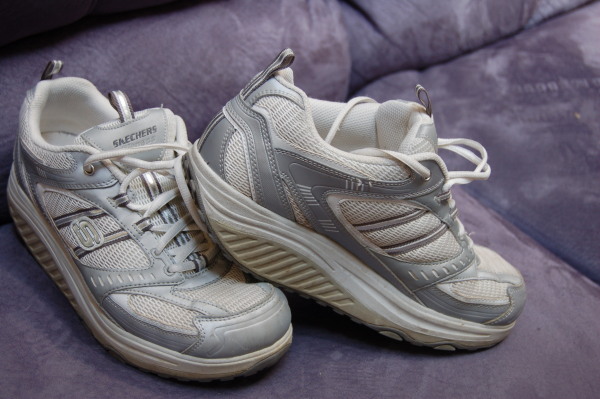 I also have a pair of rocker-soled Sketchers. The shoes you wear need to have enough depth to accommodate your orthotics. As RA progresses, most of us change from walking heel to toe to a sort of shuffling and a delayed heel lift. Rocker-soled shoes are thought to slow this progression. I have a pair of these type shoes, and the best thing I have to say about them, is that they reduce the pain in my knees and ankles. They are deep enough to accommodate my orthotics, but I do not wear my orthotics with my rocker shoes. They are very padded, and are more comfortable without the orthotics. Easy Spirit makes shoes that are comfortable and offer a lot of support. I have found that they also accommodate orthotics well. ASICS brand running shoes are the most comfortable running shoes I have ever worn. Best part is, they also accommodate my orthotics. Accomodative orthotics are meant to cushion sore feet. These type of orthotics are often used by diabetic patients. They are made of soft material such as rubber, cork, or plastic foam. Functional orthotics are made from a rigid material. They are designed for people who have pain in the arches, heels, ankles or toes. These are the type of orthotics I have and they help the pain I have in my knees and hips, as well as the pain I have in my feet and ankles. Orthotics work by redistributing weight and relieving pressure on the areas of your feet that hurt. They can also help correct your gait. If you are experiencing pain in your feet or ankles, you might want to ask your doctor about orthotics. A lot of insurance plans cover the entire cost of having your custom orthotics made. I am finding that the benefit of orthotics for the Rheumatoid Foot are a well-kept secret, and that is a shame. My orthtoics have give me freedom of movement and the peace of mind I was starting to lose. If you have problems walking, please ask your doctor about trying orthtoics. I think you will be happy you did!